People took part in a peace walk Sunday in the labyrinth of the Armenian Heritage Park on the Rose Kennedy Greenway in Boston. 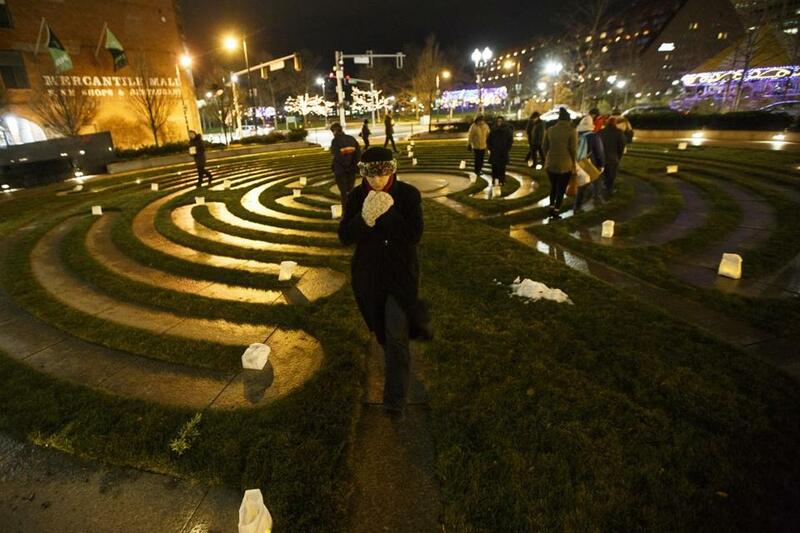 Guided by flameless candles flickering in weighted paper bags, about 50 people explored the labyrinth inside the downtown Armenian Heritage Park on Sunday evening, a journey intended to elicit peaceful reflection on the difficult year that is ending and the new year to come. Participants gathered in the cold and high winds at the Rose Fitzgerald Kennedy Greenway to see friends and family, sing Christmas carols, and follow a path that many find inherently soothing. Don Tellalian, 80, the architect who designed the park, attended Sunday’s third annual Candlelit Labyrinth Peace Walk with his wife, Barbara, who helped organize the event. He said he chose the labyrinth as a symbol of life’s journey but also as a way to engage visitors. Nearby, another organizer, Susan Deranian, helped visitors write wishes on ribbons and tie them to a “wishing tree.” Most called for peace, for kindness, for greater patience. It’s the spirit of the holiday season, said the Peabody resident, 67, and a sentiment that is especially important in this fractious political climate. “We’re in upheaval, and we need something to anchor us,” she said. Bethany Adam, 23, came to the walk in solidarity with the Armenian people and in tribute to those killed in the Armenian genocide of 1915 to 1923. “I think that events like this help us remember that we aren’t alone,” said the Somerville resident, who plans to study international human rights and civil liberties. Anan Howsawi, 24, a UMass Boston student from Saudi Arabia, said she is alone in the city during the holidays and appreciated the warm welcome she received at the peace walk.